Situated within `The Avenues` area of Exmouth, a rare opportunity to be able to offer this spacious, extended 5 bedroom detached chalet style bungalow with one original owner from new. The property is in need of some updating, but has huge potential to develop the loft area subject to planning consent, and is being offered with NO ONWARD CHAIN. This gas centrally heated and uPVC double glazed property comprises, on the ground floor, a dual aspect living room, dual aspect dining room, breakfast room, kitchen, shower room, four good size bedrooms, bathroom and separate WC. On the first floor is a dual aspect fifth bedroom and a large storage area. There is a single garage, driveway, front and rear gardens. Situated within walking distance of local shops and within easy reach of the sea front, an appointment to view is strongly advised. Situated within `The Avenues` area of Exmouth, a rare opportunity to be able to offer this spacious, extended 5 bedroom detached chalet style bungalow with one original owner from new. The property is in need of some updating, and is being offered with NO ONWARD CHAIN. This gas centrally heated and uPVC double glazed property comprises, on the ground floor, a dual aspect living room, dual aspect dining room, breakfast room, kitchen, shower room, four good size bedrooms, bathroom and separate WC. On the first floor is a dual aspect fifth bedroom and a large storage area. There is a single garage, driveway, front and rear gardens. 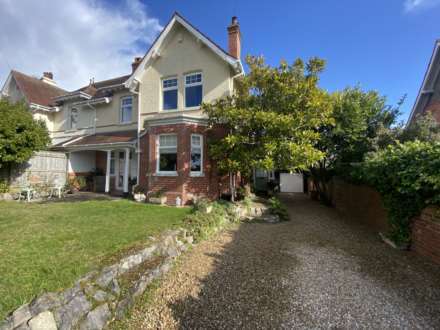 Situated within walking distance of local shops and within easy reach of the sea front, an appointment to view is strongly advised. Double glazed window to front aspect. Telephone point. Upright radiator. Coving to ceiling. Stairs rising to first floor. Door to inner hallway, living room and kitchen. Tiled shower cubicle. Circular wash hand basin. Low level WC. Wall tiling to full height. From the breakfast room and hallway, doors open into the kitchen which is fitted with a range of floor and wall mounted cupboard and drawer units with work surfaces over and tiled splash back. One and a half bowl single drainer sink unit. Space for cooker, washing machine and further appliances. Wall mounted gas boiler. Spotlights to ceiling. A dual aspect room with double glazed windows to side and front aspect. Central heating radiator. Wooden flooring. Double glazed window to rear aspect. Central heating radiator. Coving to ceiling. Obscure double glazed window to side. Coloured suite with panelled bath and pedestal wash hand basin. Coving to ceiling. Central heating radiator. Ceramic wall tiling. Obscure double glazed window to side. Low level WC. A bright and airy dual aspect room with double glazed windows to front and rear aspect. Central heating radiator. From the landing a door gives access to a very large attic space which offers huge potential for development, subject to usual planning consents. Up and over door to front. Power and light connected. The rear garden has a patio area adjacent the property, with a further paving slab area to the rear of the garden. The garden has been cut back to show its potential but still has some bushes, shrubs and plants. Timber garden shed. Front pedestrian access from both sides of the property. Mains Electric, Gas, Water and Drainage although we have not verified connection. Council Tax Band E.
From our prominent Town Centre offices, proceed out of town along Rolle Street towards Salterton Road. At the roundabout, proceed straight ahead into Douglas Avenue. Continue along this road where the property will be found towards the end of the road, on the left hand side, clearly identified by our For Sale sign.